A 49-year veteran of the U.S. Postal Service who has spent his entire career delivering mail in Boyle Heights, is at White Memorial Hospital recovering from injuries sustained earlier this month while on his route near East 2nd Street and Breed. The elder, who declined to give his age, is mentally sharp and could retire if he wanted to, but he’d rather get back on his route “because I love my work,” he told EGP. “I struggle, but if you don’t, you don’t get better,” Nakasone told EGP after a session of physical therapy that included practicing going up and down stairs. Some of his co-workers have visited him at the hospital and asked him when he’s going back to work, Nakasone said. He doesn’t have a discharge date yet, but hopes to pick up soon where he left off, delivering mail to Boyle Heights residents. Hesitant at first to be interviewed, Nakasone told EGP he doesn’t want his injury to mean his forced retirement. Boyle Heights has changed over the nearly 50 years he’s served the community as a mailman, Nakasone said. The community now has more pit bulls then German shepherds as guard dogs, each household seems to have two to three cars, where they used to have one, and the working class community overall seems to be economically advancing with many homes being remodeled and more minority families seeking higher education for their children, he said. His work as a postman has also changed over the years, he said. It’s getting tougher and there are more packages to deliver because people are shopping online and having their goods shipped by mail, he explained. “Thank you for using the Post Office,” he adds. “I like it here,” says Nakasone, who has lived in Boyle Heights for about 25 years. “My parents struggled, people here are doing the same,” he said. Born and raised in Hawaii to a Japanese-American mother and Japanese immigrant father, Nakasone says he learned this work ethic from his father who worked 8 to 10-hour days at a sugar plantation. When he came home he never yelled and always asked his four children if they did their homework, said Nakasone, who does not have any children. Nakasone was an artilleryman in the Army in the early 1960s, stationed at Babenhausen, Germany, which closed in 2007. “When I came back from the Army, the only jobs were working in the pineapple fields,” so he decided to try his luck in Los Angeles where other veterans were heading, he told EGP. For a time, Nakasone and his wife, Florence, lived in Torrance, but she wanted to move back to Hawaii and he decided to settle in Boyle Heights—just around the corner from the LAPD De Leon Hollenbeck Police Station. While he doesn’t speak much Spanish—just basic phrases and greetings—Nakasone says he gets along fine with the mostly Latino community. The best thing to do is just smile, he says about communicating with residents on his route, who he sees as his customers. The best part of the job is meeting people, he says. Gang activity can pop-up from time to time in the area, but Nakasone says he’s never had a problem. His secret? Being nice to the gang members’ mothers, he said matter-of-factly. Nakasone knows the community well from walking the streets on his route and talking to neighbors. He refers to locations by addresses not name, for example saying 1842 E 1st St. when talking about La Serenata de Garibaldi, a restaurant frequented by local elected officials and police officers. Nakasone remembers kindly Manuel Rojas, late owner of Manuel’s Original El Tepeyac Café. “I knew him for a long time, he was a nice guy,” he remembers, adding Manuel would offer him beer to be nice. Nakasone’s fountain of youth involves rarely consuming alcohol, always trying to eat healthy, and the regular physical activity that comes with his job as a postman. “I don’t sit much,” he confided. His route includes delivering to the new Boyle Heights City Hall and Seventh-day Adventist Church office—Adventist Health owns and operates White Memorial Medical Center. He remarked how he’s watched White Memorial grow and change over the years. 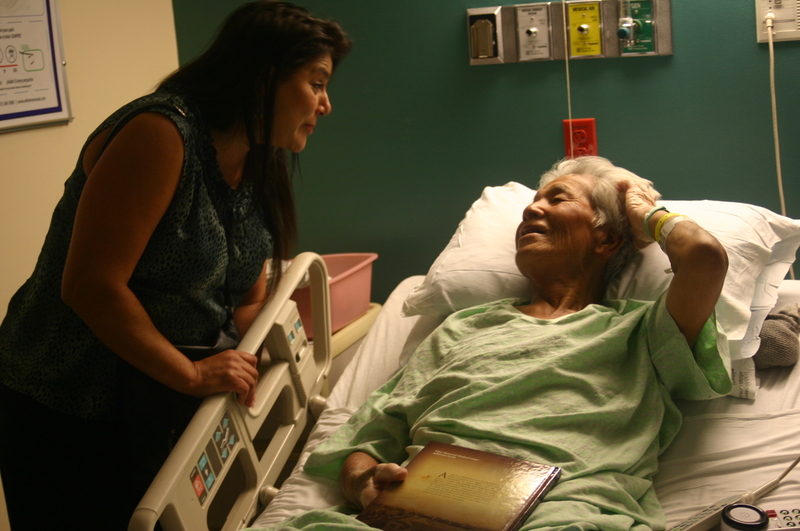 The hospital is celebrating its 100th anniversary this year and on Monday, WMMC spokesperson Alicia Gonzalez presented Nakasone with a recently published book, “A Journey of Faith and Healing,” about the hospital’s history. Nakasone happily accepted the book, saying he was looking forward to reading it. One of his favorite places to visit is Mariachi Plaza, especially for the Farmer’s Market when there is food and live entertainment. But for now, Nakasone will focus on the hard work of recovery, in hopes of returning soon to his mail route in the Boyle Heights community he loves. September 26, 2013 Copyright © 2012 Eastern Group Publications, Inc.